Like many of you, I first met Laura through social media: this website, Instagram, Facebook. Social media connects us and creates a virtual home for us to gather. We follow each other, applaud successes, speak up and comment, lend support when needed, and share our talents. Thus, when Laura asked for guest bloggers to help her out over the summer I was quick to raise my hand and give her the time off. 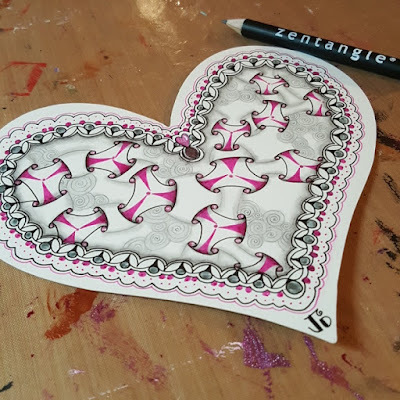 That’s one of the things I love about the Zentangle community: we really do support each other. It’s a great tribe. 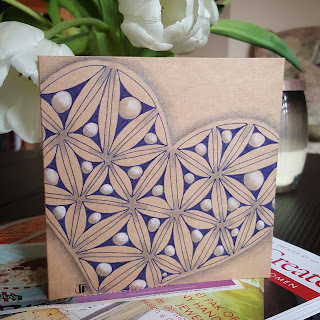 When it came time to choose a challenge for today’s post I knew I wanted to start with the first step in the Zentangle Method: gratitude and appreciation. Gratitude for Laura and how she’s created and curated this blog over the years, appreciation for our collective and individual talents, thankfulness for this art form and how it has shaped our experiences and paved the way for friendships (Laura, Amy, Camille, Patti, I’m talking about you! ), built community and fostered a sense of family. I love this community of tanglers, online and in real life, you who are in my tribe, and am so grateful to be a part of it. 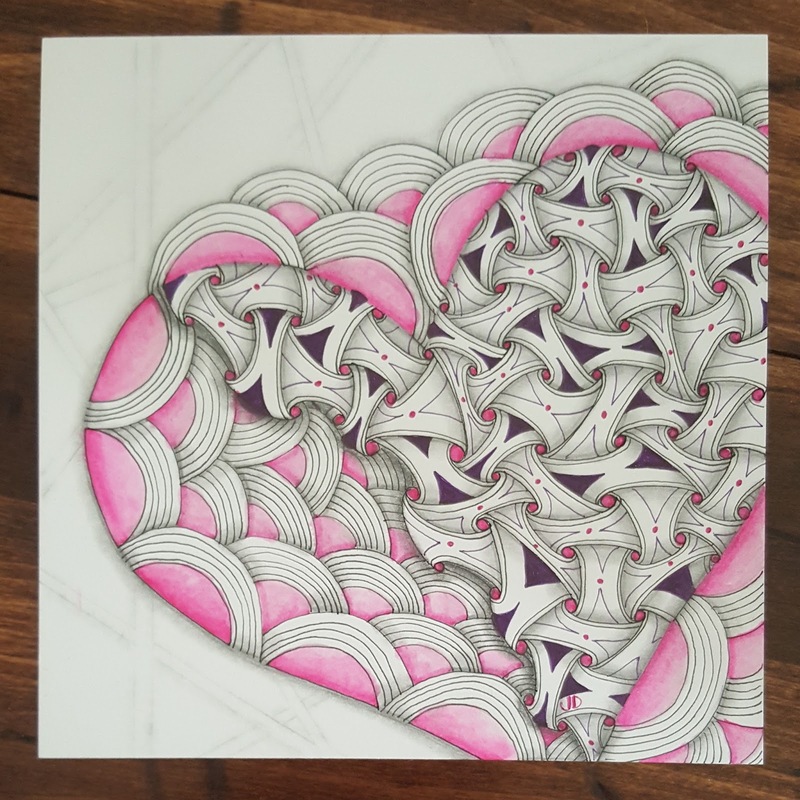 While this tangled heart demonstrates the love and connectedness, there’s also a secret to it. It stays mum on the fact that I’ve never been a big fan of heart shapes. That’s right, I don’t like heart shapes. I find they are often too cutesy, too Valentine-y, too reminiscent of middle school, too saccharin. For reals! I never liked heart shapes, y’all! Never. That all came to a screeching halt in February when I started having some pretty serious health issues stemming from, of all things, my heart. Tangling has been a comfort, stress reliever, opportunity and therapy for me these past few months. I started tangling hearts as meditation or prayer, focusing on healing my heart with each stroke of the pen. I tangled in the hospital, in recovery, when frustrated, when I got good news or bad, when I was bored with TV or when I couldn’t sleep at night. As I tangled more, the hearts became small “thank you” presents to my medical team and friends, and a way for me to talk about the realities of living with a serious medical condition. 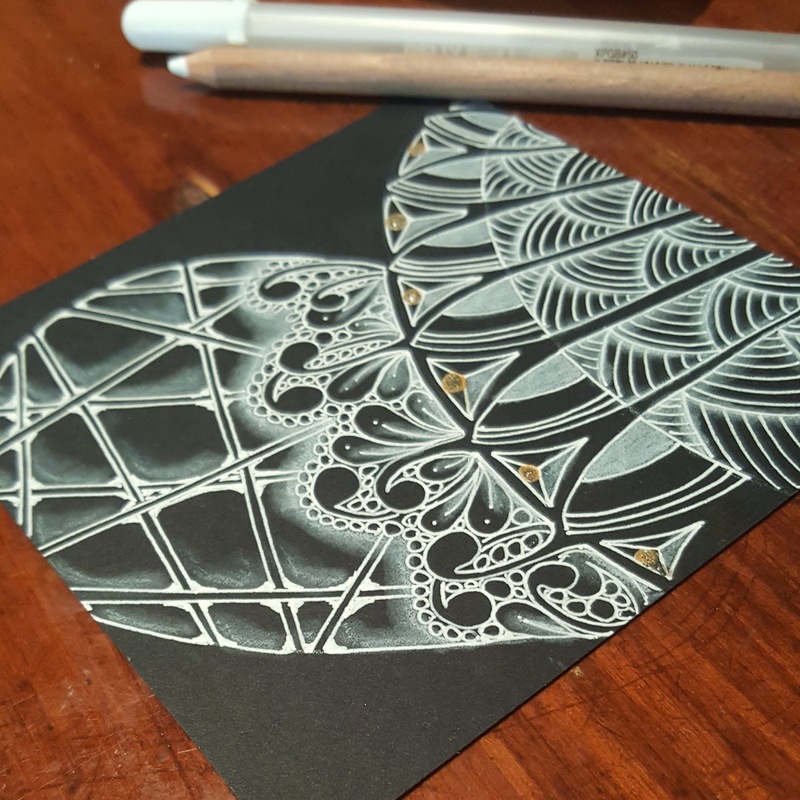 In true Zentangle fashion, the journey doesn’t end with just some random tiles. Nope. 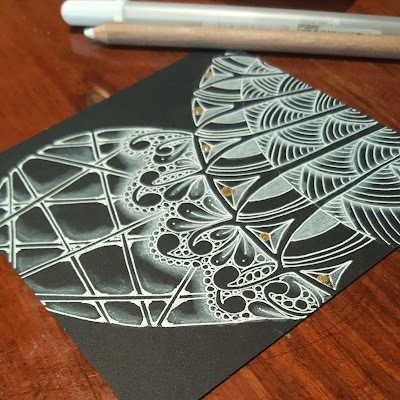 The tangling boosted my confidence, both in real life and as an artist, and led to experimentation with different mediums and patterns and pens. When the docs cleared me for regular activity I suddenly had new teaching gigs, my social media presence expanded, my heart grew exponentially as I was able to talk about my experiences, and now I’m guest blogging for The Diva! All from one very real and very tangled heart. 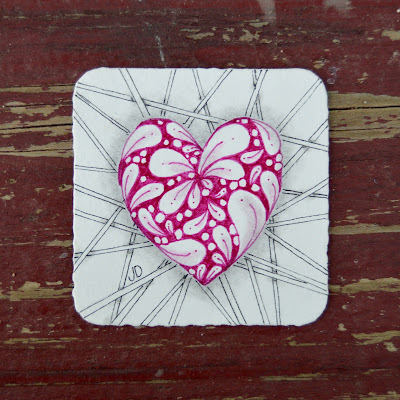 Weekly Challenge #324 "Tangled Heart"
Post your tile using The Diva’s linky wizard below. You can also use the hashtag #DC324 (Diva Challenge #324) and #tangledheart for your social media posts this week. Be sure to search those hashtags and double tap / love / show support for your fellow tanglers too! Trust me, they’ll be grateful. I also invite you to follow me on social media: on the Zentangle Mosaic App I’m JessicaDaviesCZT, on Instagram you can find me as @saltedpinkstudio, and Facebook is a combo Salted Pink Studio -Jessica Davies CZT. (Someday I’ll get around to unifying all my accounts.) You can also reach me at jessica at saltedpinkstudio dot com if you’d prefer to send an email. Thanks for hanging with me this week while The Diva takes a break, and I look forward to seeing your #tangledheart! Wow! Your hearts are simply divine. Great challenge and I'm so glad Zentangle helped you through your real life challenge. Well Jessica, like you I don't like hearts. But, after reading your story I decided to join your challenge. Thanks for your work and sharing. Your tiles are gorgeous!!! For me, it helped to find a shape of heart that I liked. 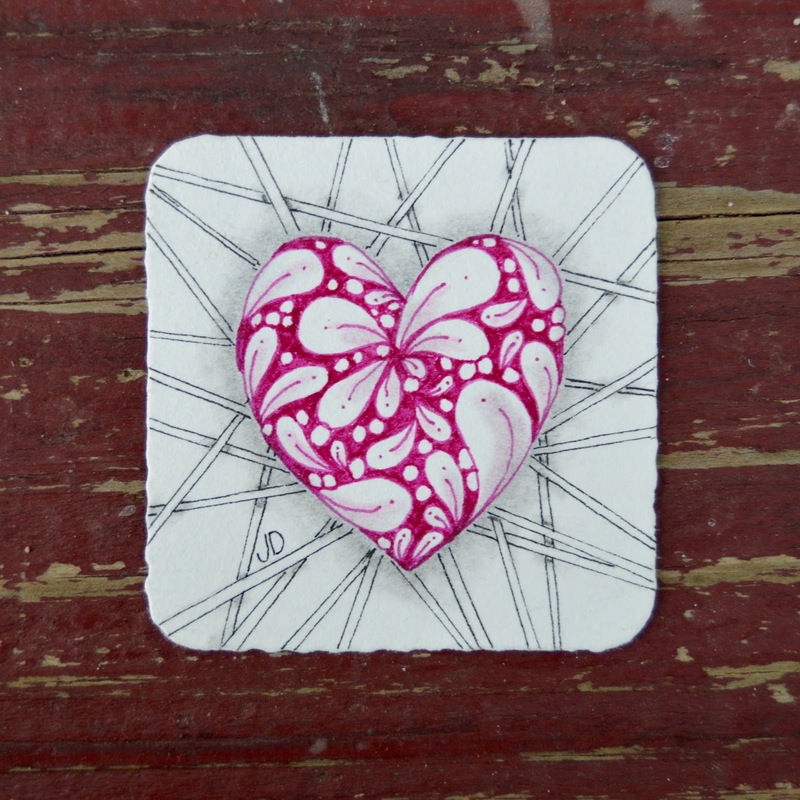 The second photo of the cut-out heart ... I used that as a string for almost all the others. It was easier not having to draw a freehand heart every time. Give it a whirl and let me know how it goes! And thanks for joining the challenge! Thanks so much, Deanne. I'm super thrilled to be doing this post too! 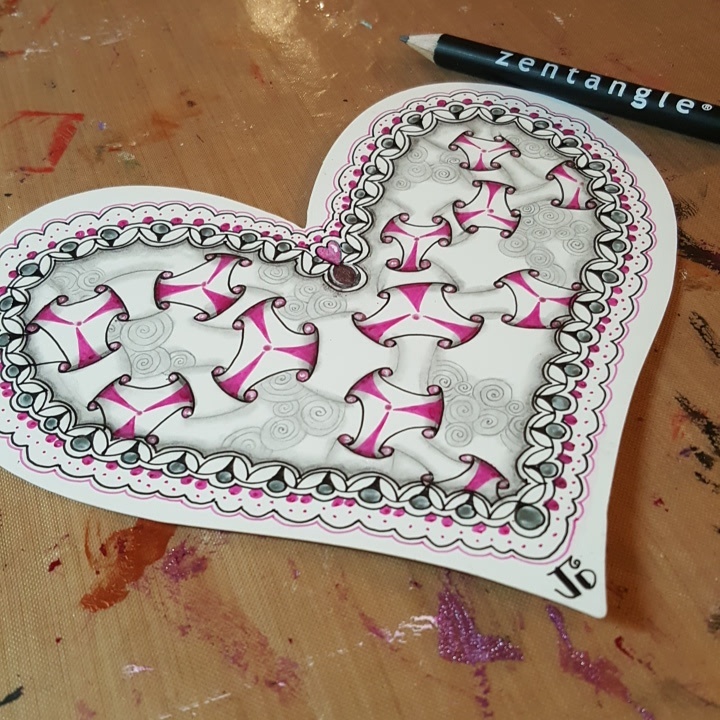 :-) Keep enjoying the Zentangle love!! Thanks for stepping in for Laura, Jessica. I'm not too fond of hearts either, but I will be happy to work on one, first to thank Laura for all she does, and second to wish you well with your heart issues. Love the inspirational ideas! Thanks for a great guest post from the heart! I enjoyed the heart challenge! Thanks, Britt. Your heart outlined in green is lovely! Great challenge Jessica. I don't do hearts all that often, but I like to do them freehand. They end up a bit wonky, but that's how I am. :-D This was fun. Thank you for doing the challenge this week. And a big thanks to Laura for all her work and getting great tanglers to fill in for her. Wonky hearts are fantastic! I really enjoyed the bright colors in yours too. Thanks for participating in the challenge this week, Melena. Jessica, after reviewing your heart work, I would like to say they are just stunning. Everyone of them. Are you on Mosaic? I would like to see more of your work. I want to wish you well with your medical problems and my wife and I sincerely hope you have fully recovered and see no more of that kind of heart problem. But do continue to do hearts in your art work. I really feel like our group is a family as much as you do. Hi Duane. Thanks so much for the compliment! Yes, I'm on Mosaic as JessicaDaviesCZT. I look forward to seeing you there! Wow Jessica. For one thing thank you for being there this week. 2 I just love the hearts you did. So inspiring. I have just started this year but I can see progress and with time practice and patience I hope mine will look as well done as yours. Hi Tara. Thank you for welcoming me this week while our Diva takes a break! Keep tangling! Jessica, all your hearts are exquisitely tangled. Thank you for sharing your heartfelt story. Hi Jessica! Thanks so much for sharing your story and your stunning hearts. 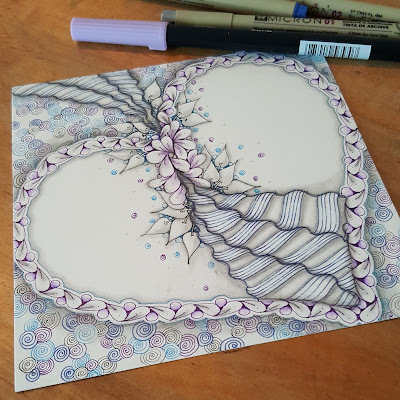 I'm not the "hearts and flowers" type and I'm always vexed by heart inspired challenges but this was a joy to do;-) Thanks for stepping in with a great challenge! Jess, hi, I am also one of those anti-heartists... In my opinion hearts as a subject are overused. If you don't know what to do, do hearts and people get all softy. But, as everyone else, in your 'tangled heart' case I see the point and hence I participated. It amazes me that with all the medical stress you had you could still draw such magnificent (he)artwork. Hats off for you, Jess, and I wish you a long and happy, tangle-crazy life. 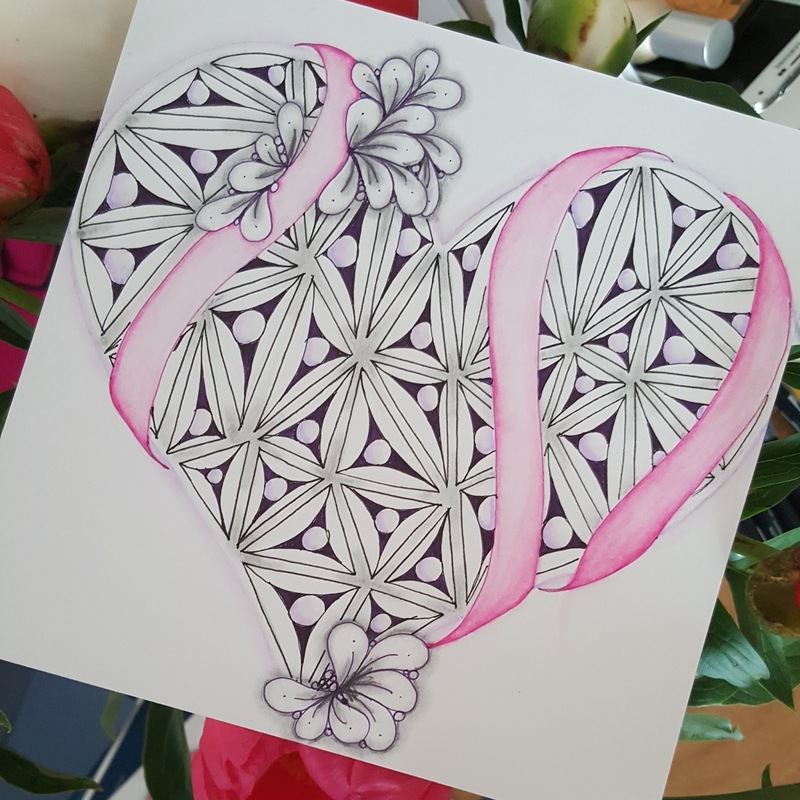 What a beautiful guest post and beautiful hearts as well. I wish you lots of good health and happy tangling! 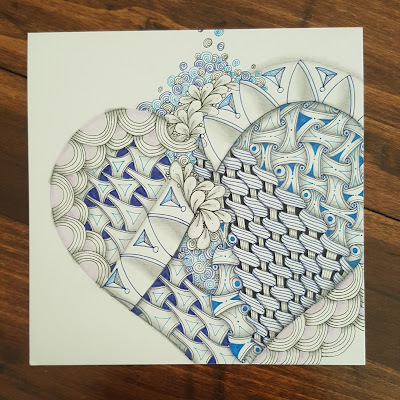 I AM SO EXCITED TO SEE MY ZENTANGLE SISTA! ..for those of you who don't know Jess personally, I got to sit right next to her when I became a CZT - I knew when I surveyed the classroom for a place to sit that she would be a kindred spirit. (esp. with PNK hair!) :) Your work always inspires me - I ADORE these hearts - I have shared them with my students to show off how a pop of color can make things shine! :) SOOO good to see you here! CAMILLE!!!!!! You are such a dear, fun friend! Thanks for the encouragement and constant inspiration. Even though we're on opposite sides of the country, I feel your creativity and energy regularly. Love you bunches!